Contrary to popular belief, children who are short for their age are just as socially adept and well-behaved as their taller classmates, a new study finds. While kids of short-stature report a marginally higher level of teasing, they stand up to their taller peers across a range of social, emotional and behavioral measures. And that’s true regardless of race, gender or other factors. MONDAY, Aug. 17, 2009 (Health.com) — Height-challenged parents around the world can now breathe a sigh of relief. Contrary to popular belief, short children do just as well as their taller peers when it comes to social skills, popularity, and behavior. Although short kids report a marginally higher level of teasing, they stand up to their taller peers across a range of social, emotional, and behavioral measures—and that’s true regardless of race, gender, or other factors. The findings, published Monday in the journal Pediatrics, are based on a study of 712 boys and girls. The study included 11-year-olds of moderate short stature, meaning those smaller than 90% of their classmates, or shorter than 4-feet-5 inches. Surendra K. Varma, MD, the vice-chairman of pediatrics at Texas Tech University Health Sciences Center School of Medicine, in Lubbock, says the study contradicts labels like Napoleon complex or short man syndrome that have been used throughout the ages. Children may be shorter than their peers due to genetics or a slower growth rate, but may end up taller than peers in adulthood. Medications used to treat conditions such as asthma or attention deficit hyperactivity disorder may also delay growth, at least temporarily. Children whose height is well below average for their age but are otherwise physically normal are considered to have a condition called idiopathic short stature (ISS). These kids represent the smallest 2.3% of children, according to the Hormone Foundation. In 2003, the U.S. Food and Drug Administration approved the growth hormone Humatrope for the treatment of the shortest children, about 1.2% of youngsters. The study had so few children in this range that it couldn't say whether extremely short children suffered socially. However, some parents with children only a bit shorter than their peers—similar to the children in the new study—ask pediatricians to prescribe the drug, the authors say. “I can tell you that this idea that my child is suffering or somehow disadvantaged socially because he or she is short is the driving factor in prescribing the medication,” Dr. Lee says. But whether these results will alter treatment decisions for extremely short children remains unclear. “Anecdotally, we hear that children being treated with [growth hormone] have better relationships with their peers, but we don’t have any good data to support this,” says Stephen F. Kemp, MD, PhD, a professor of pediatrics at the University of Arkansas and a pediatric endocrinologist at Arkansas Children’s Hospital, in Little Rock. Dr. Lee’s team pulled data from the National Institute of Child Health and Human Development Study of Early Child Care and Youth Development, a large national study of child behavior. The analysis focused on kids’ height at sixth grade because psychological and social stress associated with short stature is thought to ramp up during adolescence. The researchers used teachers’ reports of kids’ behavioral problems and popularity, and children’s reports of optimism, depression, and peer relationships, among other measures, to compare short kids with their taller peers. Overall, height didn’t seem to be related to any measures of the children’s well-being. However, shorter kids were more likely to report being teased or targeted by their classmates. Dr. Lee’s team suspects that short kids may take teasing—including terms like midget, shrimp, and shorty—in a more personal way. 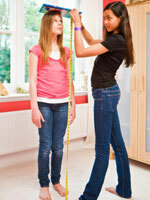 Parents may add to this by expressing concerns about height, the researchers say. “All kids get teased regardless of whether or not they’re short,” she says, “and it’s possible that short kids focus more on the teasing, misattributing it to their short stature.” However, the researchers found that short kids were just as likely to be popular and no more likely to be excluded by peers than taller children. Dr. Kemp suggests that parents help kids practice the appropriate response to a bully. “It is very helpful to do role-playing at home in developing strategies for coping,” he says. He also urges parents of kids on growth hormones to be patient. “Growth from being treated with [growth hormone] takes place over a number of years, so the impact of a faster growth rate doesn’t make you tall immediately,” he notes. Parents of very small children often make the mistake of treating their children younger than they actually are, adds Mary Andrews, the CEO of the Magic Foundation, an Oak Park, Ill.–based nonprofit that supports families of children with growth hormone deficiency or other medical conditions affecting their growth. Freshman Stress: "Mental illness surfaced when I started college"